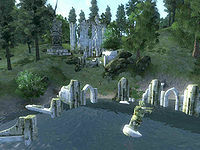 Bawn is a medium-sized Ayleid ruin southeast of Bravil containing undead. It contains three zones: Bawn, Bawn Loria, and Bawn Latta. Most of the Welkynd Stones in this ruin are mounted on pedestals and are out of reach. See the Welkynd Stone article for suggestions on how to reach them. This location's map marker (M on map) is named Bawn (editor name BawnMapMarker). The entrance door is SE of the marker, 80 feet away. You may encounter The Forlorn Watchman in the area as he passes by Bawn on his nightly circuit. 1 Restoration Ayleid Chest can be found outside. There are two doors connecting this zone to Bawn Loria. Door D (closest to the front door) is on an upper level and can only be used when returning from Bawn Loria. To get to door C you need to wander through the rest of the dungeon. When you return here from Bawn Loria through door D, be sure to explore the room at the south end of the bridge, which contains most (seven) of the Welkynd Stones in this zone as well as one Ayleid Cask. Then jump down from the bridge to get back to the front door. 10 Welkynd Stones. 7 are in the southeast room that can only be accessed after returning through door D; the other 3 are in the northeast room, after gate H.
2 doors (at C and D) lead to the zone Bawn Loria. D is on an upper level and can only be used when you return from Bawn Loria. 2 Iron Gates (opened remotely) at G and H, both of which are opened by standing on the activation panel in the floor in front of them (the cyan dots on the map). This zone contains Bawn's only Varla Stone, and also has a boss-level Ayleid Reliquary (without any boss-level monsters). However, there are no Welkynd Stones in this area. There are two doors from this zone to each of Bawn and Bawn Latta. You will enter from the first zone using door C. To get to Bawn Latta you will have to use the northern door E; the southern door at F is blocked by a gate that can only be opened from the other side. When you return to Bawn be sure to use door D.
Right after entering the zone you will find the Varla Stone cage (V), which is activated using a push block in the next room to the northwest (at the cyan dot on the map). Unless you really like poison gas, don't bother going down the hall northeast from the Varla Stone, since the room contains nothing but poison gas traps (G). 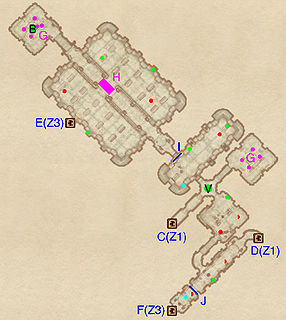 The locked door at I leads to a large room with a collapsing bridge at H. Be sure to jump across the collapsed span because on the far side of it is an otherwise inaccessible room with a boss-level Ayleid Reliquary (B, surrounded by poison gas traps). Once you jump down from the bridge, the only possible direction is through door E to Bawn Latta. 1 Varla Stone (in a Varla Stone Cage) at location V on map. 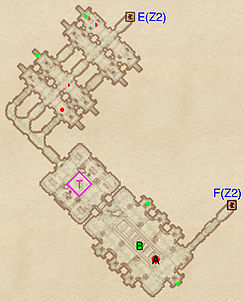 The push block to open the cage is located at the cyan dot in the next room to the northwest. 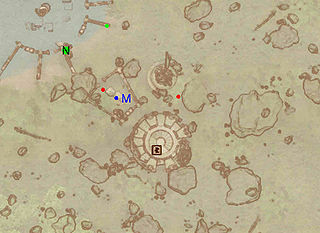 1 Crumbling Bridge trap at location H on map. You must jump across the collapsed section to access the boss-level chest at B. 2 doors (at C and D) lead to the zone Bawn. 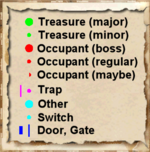 You will enter through C; you can return through either door, but D is a shortcut that lets you get some extra treasure. 2 doors (at E and F) lead to the zone Bawn Latta. F can only be used to return from Bawn Latta because it is behind the locked gate J. The activation plate to open this gate is on the west side of the door (at the cyan dot) and therefore the gate can only be opened after you have gone through Bawn Latta. This zone contains a boss-level Ayleid Coffer (B) guarded by a boss-level Undead (A). 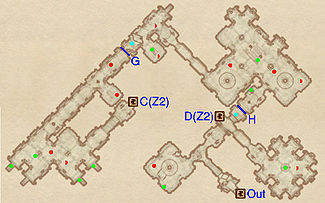 The same room also contains all seven Welkynd Stones in the zone. You enter this zone through the northern door at E, in a long hallway above the first couple rooms. If you choose to jump down, there are stairs back up to the west. The main obstacle in the zone is the ceiling spikes trap at T (the blood stains on the floor provide a warning), which can be avoided by stepping to either side of it. You must return using door F, which allows a previously unopenable gate in Bawn Loria to be opened, and provides fast access back to the first zone. 7 Welkynd Stones, all in the room with the boss chest. There are two doors (at E and F) in/out of this zone, both leading to the zone Bawn Loria. You will enter through E, and will need to exit through F (returning through E just leaves you stranded at a lower level without any way to get up to the level with the other doors). Esta página foi modificada pela última vez à(s) 05h43min de 11 de março de 2014.